Chernobyl, the site of the world's worst nuclear accident, is about to become a solar farm. Ukraine’s Minister of Ecology Ostap Semerak said more than 50 investors from all over the world have applied to build the solar farm to generate electricity in the Exclusion Zone. The world's worst nuclear accident happened on April 26, 1986. Thirty-two people died and dozens of others suffered painful radiation burns. It took Swedish authorities reporting the fallout to prompt the Soviets to admit an accident had occurred. 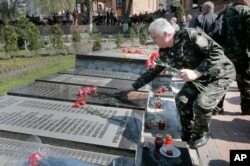 FILE - A Ukrainian lays flowers on the tombstone with his relative's name, during a requiem ceremony to commemorate victims of the Chernobyl tragedy, in Ukraine's capital Kiev, Ukraine, April 26, 2015. For years, it seemed that all the people who chose to stay in Chernobyl mourned, and tried to manage. The area was ignored for decades, first by the Soviet government and later by the Ukrainian government. Now, there are signs of activity, perhaps even renewal. "Today, almost a year after we have started the work, I can announce the first private investment project working in the Chernobyl zone to build a small solar energy plant," said Ostap Semerak, Ukraine's minister of ecology, in an exclusive interview with VOA. It's projected to be completed in May. Semerak says the first private investment in the Chernobyl solar farm is about $1.1 million, enough to build a power plant with the capacity of 1.5 megawatts. The investor, a Ukrainian-German company, has already implemented similar projects in Belarus regions, which had suffered from the Chernobyl disaster. “The appearance of the first, albeit small, power plant evidences that the project is alive and may be followed by powerful investors, who are more inert and less mobile,” said Semerak. Domestic and foreign companies, small companies and energy giants are among those who have expressed interest in constructing the solar farm in the Exclusion Zone. When it is built out, the solar park is expected to produce half the power that was produced by Chernobyl’s nuclear plant after it went on line 40 years ago. "Cumulatively, those would be enough to produce 2.5 gigawatts of power, which would be 2,500 megawatts," said Semerak. "This is comparable to the output by two units of a nuclear power plant. This is about half the capacity which the Chernobyl power plant had before the disaster." The Chernobyl Zone has attracted investors because of its vast land resources and economic incentives, according to Semerak. The government recently lowered the cost of rent and streamlined renting procedures. Another powerful driver for investors is the availability of infrastructure – the power grids, which serviced the Chernobyl power plant prior to the nuclear disaster. This report originated with VOA's Ukranian Service.